Bye Bye Loliondo. . . .
words in BOLD RED are links. I couldn't help wondering why the Maasai - the guardians of this paradise - were expelled, like Adam and Eve, from this extraordinary land on earth. Today the Tanzanian government has attempted to build a road across the northern Serengeti; they also would like to removed the Maasai from their shrinking ancestral grazing lands for self-serving governmental, foreign business investors and personal profits. . .
To the Maasai the Serengeti is "the place where the land runs on forever, but beyond the protected core of this iconic wild-scape, the land is running out. . . .
For centuries the Maasai pastoralists have inhabited lands in sub-Saharan Africa. Today Massailand spans across roughly 150,000 kilometers [approx. 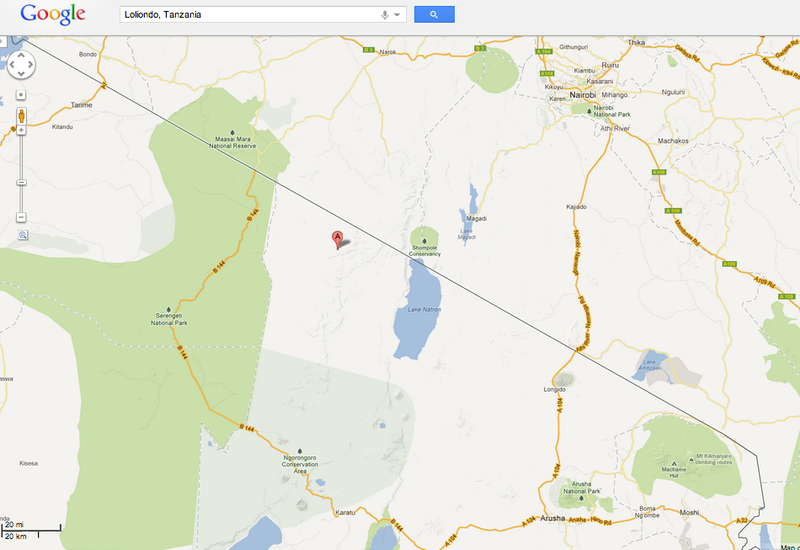 94,000 miles] of arid land in southern Kenya and northern Tanzania. The Maasai are commonly identified for their livelihoods dependent on cattle, and, the Maasai belief system stipulate3d that God sent all cattle to the Maasai. As this belief follows, all of the world's cattle belong to the Maasai, and the Maasai live their semi-nomadic lifestyle herding cattle across the Serengeti Plains. But beyond herding cattle, who are the Maasai? To most Westerners, the Maasai are the tribal people of [east] Africa who don red and purple garb and beautifully beaded jewelry. The Maasai may seem like a people that exist in a land far away, in a land unaffected by industrialization, untouched my modernity. In that view, the Maasai continue to live a traditional, primitive lifestyle. These assumptions are false and ironically, Western actions themselves in sub-Saharan Africa have created many of the difficult issues the Maasai face today. The issue of land rights and Tanzania's Maasai has been a highly contentious matter for decades. Dating back to the colonial era, when British colonizer first aggravated land tenure issues with the Maasai, to the growth of the Tanzanian tourism industry today, the Maasai are all too familiar with land disputes. Maasai land rights were challenged when European powers established conservation zones and game reserves in Tanzania. Many Western voices called for the expulsion of the Maasai from these areas because they were thought to pose a threat to precious natural habitats. Eventually Tanzania gained independence, but the issues for the Maasai persisted. The socialist policies of the newly-independent Tanzanian government affected the Maasai, as these polices pushed for the growth of the country's tourism sector. The growth of the tourism industry has drawn more foreigners to the region, while simultaneously exacerbating land issues for the Maasai. The reality is that sub-Saharan Africa is becoming increasingly marketable as a vacation spot, and the targeted consumers are wealthy Westerners. Ecotourism, a growing area in the industry, is beaming more popular among these targeted consumers from the West. As ecotourism grows and beams the most attractive option for many tourist, it is important to consider its implications for the Maasai. Many indicators suggest that the Maasai's historical struggle for land rights continues today, and their current struggles are rooted in the growth of Tanzania's tourism industry. The Convention for the Preservation of Animals, Birds and Fish in Africa was signed in 1900 (London) by all of the colonial powers, and became the precedent for subsequent legislation laying out conservation areas, game reserves and national parks in Africa. . . in 1951 the Serengeti National Park was established, followed by he Ngorongoro Conservation Area (NCA), Arusha and Lake Manyara National Parks in 1960. . . These parks and conservation areas came with strict restrictions for hunting, often excluding Tanzanians from the sport entirely. . . In Tanzania big game hunting was permitted for a large number of species including lions, leopards and wild dogs. . . In order to hunt in African conservation areas one had to obtain a license, which most Africans could not afford. . . Africans typically hunted for food rather than for sport, and Tanzanian conservation legislation prevented them from hunting for food or to protect their livestock as they had prior to colonial rule.  A man's life in Maasai society traditionally revolves around a series of life passages, which are marked by elaborate ceremonies. These passages include childhood (youth), moranism (warriorhood), elderhood (marriage), and finally head elderhood (old age).  A Maasai woman's life traditionally is centered around family. She is married often in her mid-teens - arranged by her parents in exchange for a dowry of livestock and handicrafts. Her (referred to as "mamas" rank in society is marked by the amount of children she has.  Popular tourists destinations in East Africa such as the Serengeti, Ngorongoro, Maasai Mara, Amboseli, and Tarangire game reserves are located inside the Maasai region. The reserves are now considered protected areas set aside for conservation, wildlife viewing, and tourism. Maasai people are prohibited from accessing water sources and pasture land in game reserves. This report was prepared by the Tanzania Natural Resource Forum in 2011, based on technical support and background research from Maliasilli Initiatives. The purpose of the report was to provide a third-party, unbiased technical and contextual review of the Loliondo conflict and the land options for moving forward. The Maasai, a pastoralist people who dwell on the fringes of the Mau Forest during the dry seasons, are also being threatened by Kenya's disregard for the rights of indigenous groups. The Maasai's land once extended over a vast stretch of area from Lake Victoria almost to the Indian Ocean. But diseases and the European colonization in the late nineteenth and early twentieth centuries reduced their land substantially. Since independence in the 1960s, more and more of their land has been taken over for private farms and ranches, government projects, and wildlife parks. Survival International states that six of Kenya and Tanzania's national parks alone cover more than 13,000 square kilometers (5,000 square miles) of what was once Maasailand. The Maasai Environmental Resource Coalition (MERC) is a not-for-profit making organization founded in Kenya and Tanzania in 1987 to protect Maasai traditional lands and the rich ecosystems within them. MERC's mission is to advocate for the protection of the Maasai people's traditional lands and to promote conservation, management, and sustainable use of the ecosystems within which they live. "At the time of colonization, we the Maasai of what is now Kenya and Tanzania lost 75 percent of our ancestral lands and were relegated to what were known as the 'Maasai Reservations,'" said Meitamei Olol-Dapash, coordinator of MERC, in a recent statement. "We lost most of our dry season grazing lands and sacred sites. Without land, the Maasai cannot survive," Olol-Dapash continued. "Land to us is the foundation of our livelihood, spirituality, and identity. It is the cornerstone of our cultural reproduction." According to Olol-Dapash, the last two sacred sites remaining in Maasai hands — the only watershed areas in Maasailand — are under threat from external interests. "Namina Enkiyio (Forest of the Lost Child) is the last holy ground on which the Maasai conduct solemn ceremonies and the Mau Forest is the Maasai 'Promised Land,'" he said. "Powerful economic interests want the Forest of the Lost Child for tourism," Olol-Dapash continued. The "developers" have also targeted the Mau Forest for large-scale tea plantations and the corporate Water-Mafia wants to get it into their hands. With little or no economic resources to seek legal redress, the Maasai are vulnerable and could very well lose these sacred lands." Mobilization by women, online activism, media coverage, use of land laws and elected officials all helped bring Loliondo success. . . Activists have claimed victory in a campaign to stop Tanzania evicting 40,000 Masai pastoralists from their ancestral land to make way for a big game hunting reserve for Dubai's royal family. "The OBC (Ortelo Business Corporation) called last week and wanted a meeting with us," Samwel Nangiria - co-ordinator of the local Ngonett civil society group - said. "They are feeling very threatened, for sure." The international effort was led by the online activism site Avaaz.org, whose Stop the Serengeti Sell-off petition attracted 1,775,320 signatures and led to targeted email and Twitter protests. It argued that the Masai would be robbed of their livelihoods if their land was used for the commercial hunting of prize game such as leopards and lions by UAE royals.
. . . Prime Minister, Mizengo Pinda, has decreed that the Maasai can continue living in the 1,500 square km (580 square mile) region in the far north, reversing an earlier government order that required them to keep off the land in a move aimed at protecting wildlife and water catchment areas. "This land was meant for conservation, which is a good idea, but on the other hand, we have come to the conclusion that the Maasai pastoralists who have inhabited the area since time immemorial are good conservationists themselves, thus can still take good care of the area," said Pinda, who travelled to Loliondo to make the announcement, amid jubilation from thousands of herders who had gathered to hear him. "Across the world millions of people – the majority of them indigenous – have been evicted from their homes in the name of conservation. It should be no surprise that tribal communities that have been evicted from their lands go from being 'the original conservationists' to 'enemies of conservation' - as Maasai leader Martin Saning'o told a shocked group of conservationists. Alienating communities from their lands in the name of conservation breeds poverty, resentment and anger – all of which undermine conservation." Earlier this month the case against five herders, which had been going been going on nearly a year, was dismissed with the magistrate ruling the five herders had "no case to answer.” The prosecution had failed to show there was sufficient evidence that would require the accused to put up a defense. So the DC's attempt to ‘make an example of them’ has failed and only strengthened the communities determination to oppose Thomson. According to the case charge sheet from July 2012 - click here to view - two of the herders (Kikanay Rogei and Somito Mingini) are in fact children. Therefore the prosecution against these two minors for criminal trespass was illegal as well as seemingly malicious. Prof. Borner: The Loliondo Game Controlled Area (GCA), to the east of the Serenget National Park, with a size of more that 4,000 km forms an important past of the Serengeti ecosystem. It is an integral part of the migration routes. At the same time it is an important grazing area for the Maasai communities, and a production area for tourism activities. For the past 20 years, conflict over the land between the government, investors andd communities has carried on, with all side firmly entrenched in their positions and seemingly no end in sight. Through out this time, growing numbers of inhabitants and livestock as well as increasing climatic uncertainties including severe droughts have added to the challenges. . .
Dr. Baldus: . . . How do you judge the fact that a million people sign (AVAAZ website) petitions against decisions of a sovereign African Government without informing themselves properly first? Prof. Borner: The Maasai are an interesting and handsome people that evoke all the dreams of western society for a life in harmony with nature. It is true that they are very tolerant of living together with wildlife and are consequently a good neighbor to the Serengeti National Park. Unfortunately, like the "American Indians" their lifestyle has been idealized by the western media. The truth seems to me that they are a people that are caught in the impossible situation to keep a traditional lifestyle and their obvious needs for development and integration into the modern Tanzanian Society. . . it seems very difficult to be able to get a balanced picture of the situation through the media and the reports from the human rights organizations. . .
Tanzania's Ministry of Natural Resources and Tourism announced in March that it plans to forbid 30,000 Maasai tribespeople from entering a 1,500-km stretch of their traditional homeland bordering Serengeti National Park. The Maasai, who depend on this land to support their cattle herds, will face abject poverty if the measure goes through. This is not the first time the government has denied the Maasai the right to live in Loliondo Game Controlled Area (LGCA), which they legally own under Tanzania's Village Land Act. In 2009, the government evicted more than 3,000 Maasai from eight villages bordering the national park. More than 200 Maasai huts were burned down and some 50,000 cattle were driven into an area plagued by extreme drought, plunging the community into an immediate crisis. Members of the community also reported rapes and beatings at the hands of government riot police. Maasai have also been evicted from a total of 13,000 square kilometers of parkland in Tanzania and neighboring Kenya. In addition to the imminent Loliondo evictions, the Tanzanian government has also proposed the removal of 40,000 more people from Ngorongoro Conservation Area, which borders Loliondo to the south. Maasai women's organizations have organized sit-ins to protest the Loliondo measure after broader protests failed. At least 1,000 women have participated in the sit-ins, despite a government ban on public gatherings and intimidation from police forces. The highlands encompassed by the proposed "wildlife corridor" in Loliondo are crucial to Maasai herdsmen during the dry season, and comprise 40% of their total cattle grazing area. Cattle are already stressed by increasingly later rainy seasons as a result of global climate change. According to Tanzanian officials, the Maasai are overgrazing the land and must be removed in order to protect the area’s wildlife. To drive the point home, the country’s president, Jakaya Kikwete, recently told a group of Maasai pastoralists that “living a nomadic life is not productive." Contrary to the government’s stated reasoning, studies show the Maasai are especially good at managing livestock sustainably without taxing the land, and that their methods actually improve conditions for wildlife. Several Maasai organizations, in a recent press statement, claimed that wild animals take refuge in their villages when fleeing recreational hunters. The Maasai also lived in stable balance with the now "protected" ecosystem for more than two centuries before the national park was established. In fact, the LGCA was created with the intention of allowing the pastoralist Maasai to continue their traditional way of life within its borders, but the area’s tourism industry, along with its conservationist façade, has muddled that purpose and whittled away the Maasai's territory. "Dear guest, welcome to UAE." For centuries, the sprawling savannah in the Arusha region of the East African nation was home to the Maasai people, but these days it can feel more like Dubai, one of the states that make up the UAE. That is because this chunk of land in Arusha's Loliondo area near the Serengeti National Park has been leased to an Emirati hunting company called the Ortello Business Corporation (OBC). Since 1992, OBC has flown in wealthy clients to shoot lions and leopards, angering nomadic Maasai cattle herders who are blocked from pastures in the hunting grounds. Now, Tanzania's government wants to give more land to the hunters by establishing a 1,500 sq km (579 sq mile) wildlife corridor exclusively for OBC. Ngorongoro District Commissioner Elias Lali told The Citizen that scores of animals had died due to lack of pasture and water in the district, which has in recent months been overwhelmed by an influx of starving cattle from other parts of the region and as far afield as Kenya.  07-04-2009 Video: "Loliondo is Burning"
 More than 200 bomas (homesteads of extended families) have been totally burnt.  Food stores and maize fields have been burned.  It is estimated that up to 3,000 people have been made homeless without food and shelter.  Several maize farms, which were ready for harvest, were set ablaze exacerbating an already alarming hunger situation.  More than 50,000 cattle have been pushed into areas hit by extreme drought with no water and grass. Some cattle have been lost and some burned to death.  Property worth millions of Tanzania Shillings has been destroyed.  Other women who were chased from their homes have had miscarriages.  Family units have been broken and some children have been lost in the bush due to the chaos and panic during the evictions.  Communal and traditional worship places have been destroyed.  Got CNN and the Guardian to visit the Maasai and break the wider story to the world.  Advised Maasai elders on their campaigning strategy.  Flooded Ministers and the President with messages - forcing debate in cabinet and Parliament.  Ran a hard hitting newspaper ad in an influential paper which publicly shamed the government.  Persuaded diplomats worldwide to raise the issue - embarrassing the government.  Financially supported Maasai elders to travel to the capital where they gathered to 'occupy' land outside of the Prime Minister's office for weeks, refusing to leave until he met them. Beyond F.G.M. is group of UK and African midwives who are committed to helping their African sisters in overcoming this cruel, harmful and outmoded traditional practice. Female genital mutilation (FGM) comprises all procedures that involve partial or total removal of the external female genitalia, or other injury to the female genital organs for non-medical reasons. The harmful effects of FGM can include hemorrhage, shock, sepsis, psychological trauma and even death. The practice is mostly carried out by traditional circumcisers, who often play other central roles in communities, such as attending childbirths. . .
 03-03-2012 Kenya Continues To Drag Its Feet. . .
 11-07-2011 Kenya: Rights Groups Threaten to Sue. . .
 Integrating Pastoralist Livelihoods and Wildlife Conservation?  Lack of education for Maasai girls. Normally Maasai women are expected to concentrate on building and repairing houses, fetching firewood and water, and milking animals, as well as raising and feeding children and cooking for the male family members. The lack of educated and professional Maasai women to fight for gender equality and against patriarchal household structures is therefore self-perpetuating.  Lack of financial independence and property ownership rights. Lack of financial assets and resources deprive women of the right to access basic needs such as health care, a balanced diet for them and their family, clothing, shelter and educational opportunities for their children.  Lack of participation in political decisions. Traditionally, Maasai women are not allowed to speak in public/community meetings or participate in decisions. As a result, community agendas are determined by men and issues of concern to women, such as domestic violence, forced marriage, women’s property rights and HIV/AIDS are not given appropriate attention or priority. The Stop Thomson Safaris campaign is run by a group of people who have seen first hand the effect of Thomson's occupation on the residents of Loliondo, Tanzania.  03-28-2013 Land grab could spell . . .
"All the years of calling the Indian a savage has never made him one." Luther Standing Bear, Lakota Sioux. To many observers, East Africa's Maasai pastoralists hunt lions for two distinct reasons: to retaliate against lions that kill livestock or to engage in a cultural rite of passage. But that binary view reflects mistranslations of Maasai terms and simplification of their cultural traditions and their relationship with wildlife, a team of researchers led by a University of Colorado geographer has concluded. Some conservation initiatives designed to save lions from being hunted have either failed to work or in some cases appear to have incited Maasai to hunt more lions as a form of political protest, the researchers report. Lion-hunting is limited in Tanzania to mostly tourist hunting with permits, unless the hunt is to eliminate a lion in defense of life or livestock, and outlawed in Kenya. Still, lion-hunting regularly occurs in both countries, usually without the hunters’ following the law. Although the primary motivations for lion hunting differed somewhat between Tanzania and Kenya, the researchers emphasize that Maasai have multiple, overlapping reasons to hunt lions: to reaffirm the protective role of young warriors, to help select brave leaders among warrior groups, for individual warriors to gain prestige, to eliminate lions that prey on livestock and to prevent lions from becoming habituated to eating livestock and sometimes harming people. "“If you want to protect lions, it’s not just about teaching Maasai how to protect lions but also about understanding to begin with why they’re hunting lions and then recognizing that this is partly related to conservation politics.” says Mara J. Goldman, assistant professor of geography at CU-Boulder. "Early in the morning, a group of male warriors creeps out of the village and heads for the savannah. They must be careful not to wake the other members of the tribe, lest they be accosted by the women or elders. Once they have regrouped on the plains, the warriors begin preparing for the hunt. The eldest members of the group choose the most qualified hunters, known as ilmeluaya, meaning men who are not afraid of death. Warriors who are not selected are sent home in shame. ,br> To the Maasai, lion hunting is about more than food and security. It is a way to strengthen the bonds of community and the hierarchy among the hunters. Disputes over power are settled before the hunt, and roles are reinforced at the end, with the bravest warrior receiving the lion's tail as a trophy. Although Maasai society is very different from contemporary America, both share the human need to cooperate and live together in order to survive." "To many observers, East Africa’s Maasai pastoralists hunt lions for two distinct reasons: to retaliate against lions that kill livestock or to engage in a cultural rite of passage. But that binary view reflects mistranslations of Maasai terms and simplification of their cultural traditions and their relationship with wildlife, a team of researchers led by a University of Colorado geographer has concluded. Further, some conservation initiatives have either failed to work or in some cases appear to have incited Maasai to hunt more lions as a form of political protest, the researchers report. Such nuances are important, because it’s harder to control the hunting of lions unless society knows precisely why lions are hunted, the researchers contend. Many populations of 'Panthera leo' (African lions) are falling, and the species is classified as “vulnerable” on the International Union for Conservation of Nature and Natural Resources’ Red List. “We saw an inaccurate representation of the exact reasons for why Maasai hunt lions, and we had a lot of ethnographic background to correct that,” says Mara J. Goldman, the assistant professor of geography at CU-Boulder who led the study. Goldman collaborated with Joana Roque de Pinho, a post-doctoral researcher at the Instituto Superior de Ciencias Sociais e Politicas (Universidade Técnica de Lisboa, Portugal), and Jennifer Perry, a CU-Boulder geography alumna now studying law at the university. Goldman and her fellow researchers conducted 246 in-depth interviews of Tanzanian and Kenyan Maasai between 2004 and 2008. They found that Maasai hunt lions for multiple overlapping reasons, some relating to predation on livestock and some not. In some cases, Maasai said they hunted lions to prevent the potential killing of livestock, especially by lions that had killed livestock before, rather than just as a retaliation. These sentiments were expressed in a village bordering the Manyara Ranch, a Tanzanian conservation trust on which hunting is prohibited but over which Maasai from neighboring villages are meant to share governance . In the beginning, the elders kept the warriors from hunting lions, the researchers found. After Maasai representation in ranch governance was diminished, the Maasai felt disenfranchised. Lion hunting increased in frequency and severity and was no longer discouraged by elders, the researchers report. Goldman researches human-environment relations with the Tanzanian and Kenyan Maasai, one of the most recognizable ethnic groups in Africa, known for its distinctive, colorful dress and social customs, and most recently for their lion hunting practices. “The overlapping reasons reported for hunting lions illustrates the limitations on the dichotomous explanation of Maasai lion hunting as either a cultural manhood ritual or a retaliatory act,” the researchers write. “Lion conservation projects rarely address such complex politics." Researched, photographed, and compiled over 20 years, Peter Beard's End of the Game tells the tale of the explorers, missionaries, and big-game hunters whose quests for adventure and "progress" were to change the face of Africa in the 19th and 20th century. This landmark volume is assembled from hundreds of historical photographs and writings, starting with the building of the Mombasa Railroad ("The Lunatic Line") and the opening-up of darkest Africa. The stories behind the heroic figures in Beard's work -Theodore Roosevelt, Frederick Courtney Selous, Karen Blixen (Isak Dinesen), Denys Finch-Hatton (the romantic hero of Out of Africa), Philip Percival, J. A. Hunter, Ernest Hemingway, and J. H. Patterson (famous for hunting down "Man-Eating Lions of Tsavo") - are all contextualized by Beard's own photographs of the enormous region. Shot in the 1960s and '70s in the Tsavo lowlands during the elephant-habitat crisis and then in Uganda parks, Beard's studies of elephant and hippo population dynamics document the inevitable overpopulation and starvation of tens of thousands of elephants and rhinos in a wasteland of eaten trees. Originally published in 1965 and updated in 1977, with new foreword by Paul Theroux. "In March 1909, shortly after the end of his presidency, Roosevelt left New York for a safari in east and central Africa. Roosevelt's party landed in Mombasa, British East Africa (now Kenya), traveled to the Belgian Congo (now Democratic Republic of the Congo) before following the Nile up to Khartoum in modern Sudan. . .
All told, Roosevelt and his companions killed or trapped over 11,397 animals, from insects and moles to hippopotamuses and elephants. These included 512 big game animals, including six rare white rhinos. The expedition consumed 262 of the animals. Tons of salted animals and their skins were shipped to Washington; the quantity was so large that it took years to mount them all, and the Smithsonian was able to share many duplicate animals with other museums. Regarding the large number of animals taken, Roosevelt said, "I can be condemned only if the existence of the National Museum, the American Museum of Natural History, and all similar zoological institutions are to be condemned." However, although the safari was ostensibly conducted in the name of science, there was another, quite large element to it as well. Along with many native peoples and local leaders, interaction with renowned professional hunters and land owning families made the safari as much a political and social event, as it was a hunting excursion. . ."
 What Areas Have You Hunted in Tanzania? "Among the artistic wonders from the North Palace of the Assyrian king Ashurbanipal (r. 668-631 B.C.) is a relief sculpture called The Dying Lion (ca. 645-640 B.C.). It portrays the intentional slaughter of a massive feline wounded by an arrow during a royal hunt. Lunging forward, the maimed beast violently spews forth streams of blood from its gaping mouth. In Assyrian culture, lions represented forces opposed to the accomplishments of urban society. Artistic renderings of them being killed by Assyrian monarchs suggest the king's triumph over such perceived forces of evil. " Critics of a recent conservation award given in the US to President Kikwete, which some described as making the goat the gardener in reference to his time in State House presiding over an unprecedented slaughter of elephants in Tanzania going into the tens of thousands, have been told to shut up by the Director of Communications at State House Dar es Salaam Mr. Salva Rweyemamu. . .
Rweyemamu in fact exposed the government’s true intent, willingly or just by shooting his mouth off as has been suggested, that the highway across the migration routes of the Serengeti will be built by hook or crook, Uranium in the Selous would be mined by hook or crook and the soda ash extraction plant at Lake Natron too would be built, even though it would destroy the only breeding place for the entire East African flamingo population.  08-06-2013 Lion encounters in the Masai Mara. . .
 05-21-2013 Not Leakey's finest hour. . .
No nonsense Natural Resources and Tourism Minister Amb. Khamis Kagesheki was blunt in his response to objections over his plans to split the Loliondo game area into two major parts . . . "there is no government in the world that can just let an area so important to conservation be wasted away by overgrazing. . ." "It is amazing for a small area like Loliondo controlled area to have more than 30 non-governmental organizations . . . But now the end has come and the nation cannot be driven by the pressure of individuals or NGOs." Loliondo has been mired in controversy for long periods of time over the hunting concession given to a UAE based company for over 20 years, which often caused conflict with local communities who felt they were pushed off their own ancestral land and denied a right to make a living at the expense of favoring "a few rich sheikhs over the wananchi [people/citzens]." 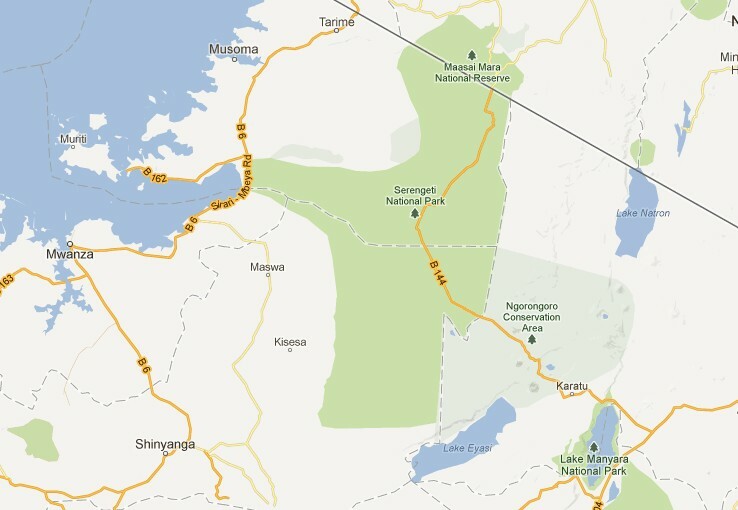  02-15-2013 Serengeti Highway case update. . .
at Mwambani damned for destruction?  06-07-2012 President Kikwete's World Environment Day speech. . .